Steeped in Hindu religion, ancient culture and long held traditions like the kecak dance and the terrifying majesty of the Barong, Bali is someplace no one leaves without feeling deeply moved. 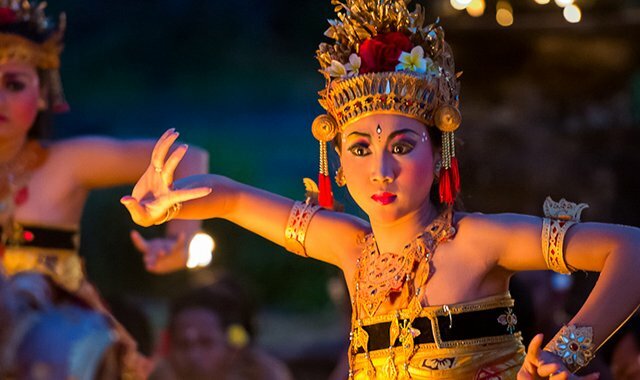 The Balinese intrinsically connect their arts with worship. Festivals and temple celebrations happen on a daily basis somewhere on the island. It is also a common sight to see streets and buildings adorned with penjor – decorated bamboo poles that curl at the tips, representing the sacred mother mountain, Gunung Agung – while little offerings known as canang are left everywhere by reverent locals as a daily offering to the gods. Balinese celebrate their saka New Year usually around March, according to the Balinese 210-day wuku calendar. Celebrations begin with New Year’s Eve parades of giant paper-mâché monster dolls known as Ogoh-Ogoh and Hindu temple celebrations accompanied by traditional gamelan music. Locals race around the island all night, clanging the kulkul bamboo bell to scare away evil spirits. From sunrise the following morning, however, the Balinese stay silent in their homes to ‘trick’ these malicious spirits into believing the isle is now uninhabited so they will leave for another year. Immerse yourself in the sacred Balinese tradition and experience the peaceful Nyepi amidst the tranquil setting of The Legian Bali. There are several worthwhile museums in which to culturally while away the heat of the day. The Blanco Museum in Ubud, founded by the Spanish artist Don Antonio Maria Blanco, is not to be missed, while the Bali Museum in Denpasar offers a comprehensive look at the island’s history and evolution. Neka Museum in Ubud is also worth visit to view a captivating collection of artworks by Balinese and foreign artists.